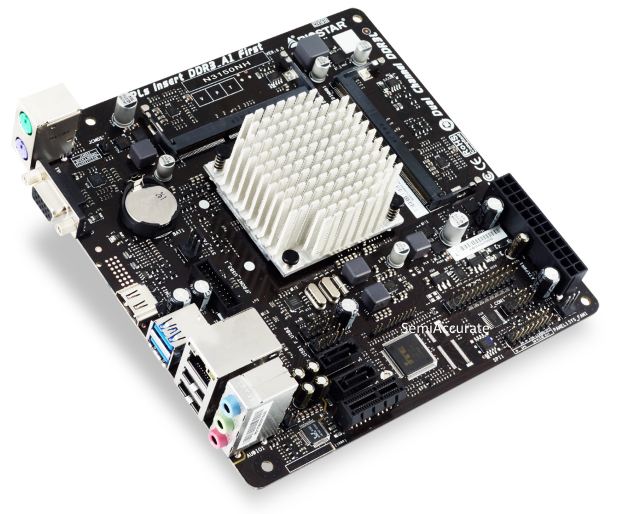 Monday Biostar released a new mini-ATX motherboard with a soldered on Intel quad-core SoC. Dubbed the N3150NH the core of this product is the unsurprisingly named Intel Celeron N3150 processor. But unlike you’re probably expect this is not another Bay Trail based offering. Rather the chip at the core of this product is from the Braswell family of SoCs that launched at back at Mobile World Congress in March. Built on a 14nm process and cored with Intel’s latest Atom core, Airmont, Braswell has mostly stayed under the radar until now. The Celeron N3150 in particular offers four cores, a base clock of 1600 Mhz, a boost clock of 2080 Mhz, 2 MB of L2 Cache, a 6 Watt TDP, and a $107 list price. It also supports DDR3L with speeds of up to 1066 Mhz with 16 GBs of RAM installed. 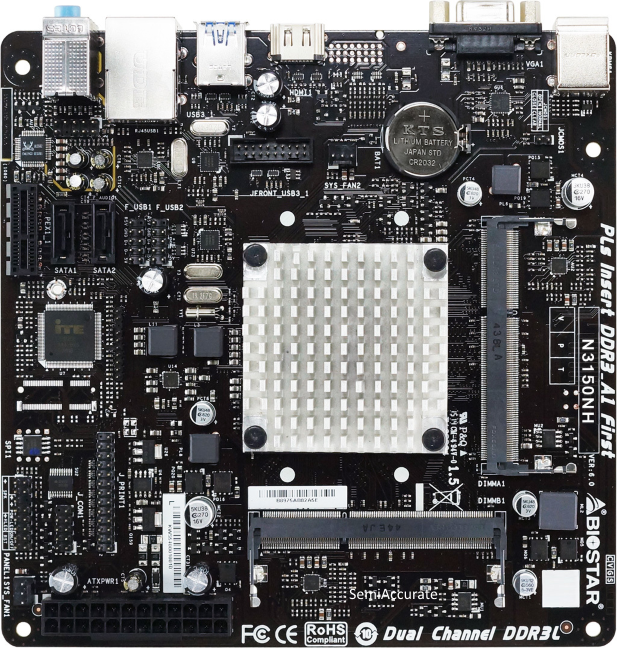 A single PCI-E 1x slot with a PCI-E 2.0 electrical connection is offered. Two SATA III ports, two USB 3.0 ports, two USB 2.0 ports, Gigabit Ethernet, Realtek HD Audio, a pair of PS/2 ports, VGA out, and an HDMI port round out the N3150NH’s I/O capabilities. Perhaps the most interesting about this product is that Biostar is selling it for a mere $69. Given that Intel’s list price for this chip is, again, $107 it would appear that something is up with Braswell pricing. Some quick back of the envelope math leads us to believe that Intel must be selling this Braswell SKU at less than half of its list price for Biostar to make any money on the sale of the product.